June 28 1909 -- The new Vernon team splits a double-header with Oakland, but for Herriman the most interesting aspect of the outing is the presence of a Japanese photographer taking pictures of the game. Here's a Jimmy Swinnerton postcard featuring his character Little Jimmy. It was a giveaway included with the Boston Sunday American at Christmas time 1906. We last discussed Beaumont Fairbank here at Stripper's Guide waaaaay back in 2007. At the time, I said that Railroad Red, his 1941 series, was one of only two strips about railroading. At the time I said that there's "...not too many train strips out there. Only other one that comes to mind that's not super-obscure is Spur Line. And it's pretty darn obscure." So today, let's discuss that super-obscure train strip I had in mind, Open Throttle and Heavy Grade, which was penned by none other than Beaumont Fairbank, close to thirty years before he would do Railroad Red. Open Throttle and Heavy Grade is more of a picture story than a true comic strip, but it is so picture-heavy that I think it more than qualifies for Stripper's Guide -- if Tarzan qualifies, so does this strip. 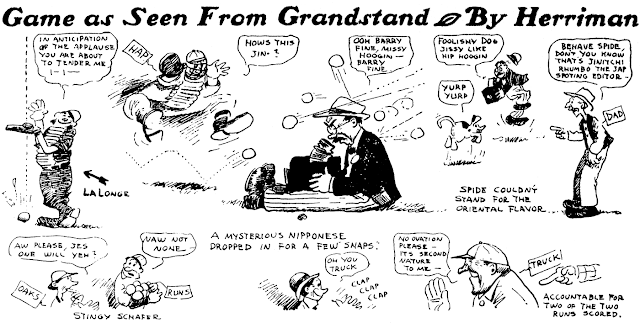 It ran in the Brooklyn Eagle, which offered a rich vein of oddball and interesting comic strips in the 1910s. 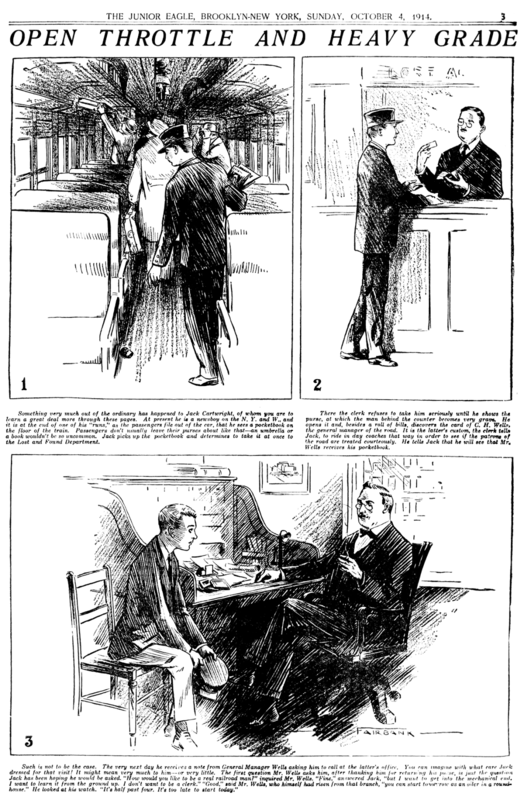 Beaumont Fairbank produced a number of those series for them, in addition to other miscellaneous art. He could do humor stuff as well as this more serious illustration style, making him a valuable commodity at the Eagle. 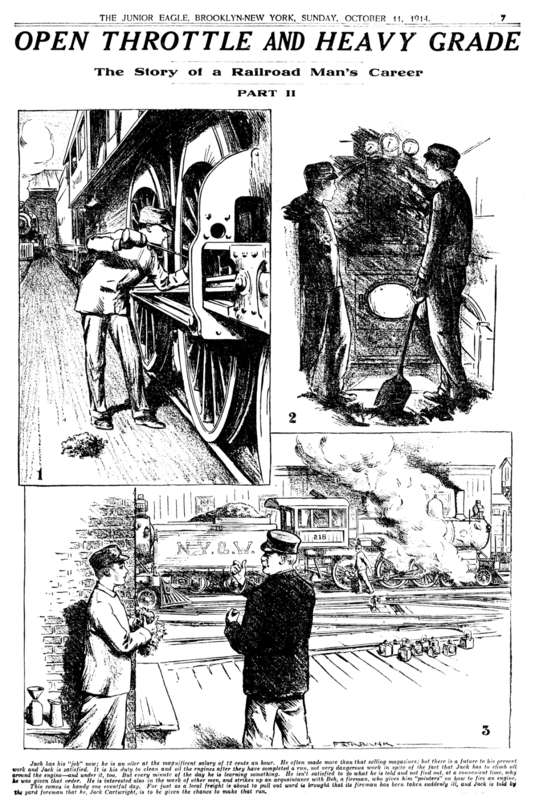 This strip is typical of the Horatio Alger 'boy meets world, makes good' story that had been popularized in 19th century dime novels, and still had its fans in the first quarter or so of the 20th century: young Jack Cartwright starts out as a newsboy, selling papers on a train. When he finds a wallet full of cash and turns it in rather than pocketing it, he's offered a job with the railroad by the impressed official. (Practically every one of these Alger-esque stories start out with this or a very similar incident). By the end of the story, Jack has become a railroad draftsman, designing rail lines at a salary of $8,000 per year. Fairbank's story is very simplistic, but that's because he was much more interested in drawing lovingly detailed full page pictures of trains than he was of telling this tale. Open Throttle and Heavy Grade ran in the Sunday tabloid magazine section of the Eagle in twelve installments, from October 4 to December 20 1914. Be with us here on Monday when Alex Jay will tell us more about Fairbank's railroad-centric life. My grandma had a huge stash of Horatio Alger novels and I read all of them while visiting her as a kid. Even as a youth I noticed that the heroes became wealthy less by "Pluck" than by "Luck." Our protagonist is having a bad time when he bumps into some kindly rich guy who opens all the doors for him. Not quite giving him a million bucks and saying, "Go make something of yourself," but similar. Thomas Harvey Peake was born on May 8, 1866, in New Albany, Indiana. The birth information is from Peake’s Social Security application which was transcribed at Ancestry.com. The same birth date was recorded on Peake’s Virginia death certificate. Peake’s parents were James S. Peake and Mary Pullen. Peake’s first name, Thomas, appeared sometimes with his verse and art credits. The initial letter T was recorded in some census records and city directories. The 1870 U.S. Federal Census counted “Thomas H. Peake”, his parents and sister, Ruth, in the household of Peake’s maternal grandparents, Louis L. and Ruth L. Pullen. Peake’s father was a clerk at a dry goods store. All of them resided in New Albany. A photograph of Peake’s parents is at the New Albany-Floyd County Public Library. In the 1880 census, “Thos. Peake”, his parents, sisters, Abbie [Ruth] and Martha, and maternal grandfather lived in New Albany. Peake’s father was a dry goods merchant. An 1888 New Albany city directory listed Peake and his father whose business was located at 48 Market Street. Peake was a clerk at his father’s store. Their residence was 111 East 13th Street. The Bulletin of the Extension Division, Indiana University, 1930, revealed information about Peake’s art training. Peake, T. Harvey. New Albany, Ind. I., D. Born, New Albany, Ind. Pupil of Carl Brenner, https://en.wikipedia.org/wiki/Carl_Christian_Brenner Fayette Barnum. https://sites.google.com/site/kentuckywomenartists/Home/fayette-barnum Member: Louisville (Ky.) AA [Art Association]; Louisville AC [Art Center]. Peake was also a writer. His poem, “The Approaching Storm”, appeared in The Lotus, June 1897. The 1900 census said the Peake family of four were New Albany residents at 1210 Ekin Avenue. It’s not know what happened to Peake’s sister, Martha. Peake’s occupation was dry goods salesman. A photograph of Peake (on the far left) with his parents and others is here. Peake’s maternal grandparents were Kentucky natives. Peake divided his time between New Albany and Louisville, Kentucky which were separated by the Ohio River. The 1900 Louisville city directory listed Peake as a clerk with the J. C. Lewis Company. Peake was a clerk in the 1903 New Albany directory. In the 1905 Louisville directory Peake was the advertising manager. Peake had the same position in the 1907 and 1909 New Albany directories. 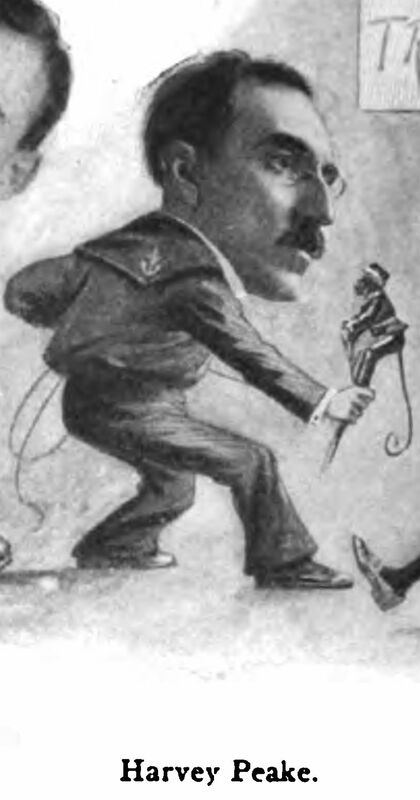 Peake was pictured with his peers in the December 9, 1909 issue of Life. New Albany directories, from 1911 to 1917, listed Peake as an artist at 1314 East Market Street. 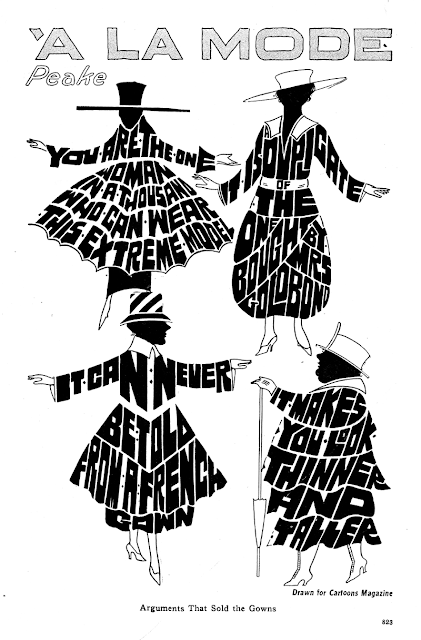 Peake was a cartoonist in the 1919 directory. The Armory Show took place in New York City from February 17 to March 15, 1913. Some of the art was parodied in the New York newspapers. In reaction to the show, the New York World, March 16, 1913, published Peake’s art in color. 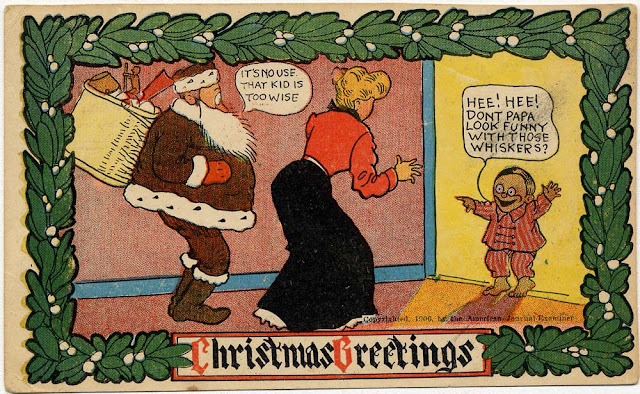 American Newspaper Comics (2012) said Peake produced two comic series, Motor Goose Rhymes (1914) for the New York Press, and Little Mike (1914–1915) for the Philadelphia Record. Peake also produced an untitled Sunday page for the Louisville Courier-Journal in 1919-20. Peake’s father passed away in August 1919. He was profiled in Biographical and Historical Souvenir for the Counties of Clark, Crawford, Harrison, Floyd, Jefferson, Jennings, Scott, and Washington, Indiana (1899). In the 1920 census, newspaper artist Peake was a New Albany resident at a new address, 222 East Spring. New Albany city directories had the artist’s address as 329 Bank Street from 1921 to 1931. Peake was a commercial artist in the 1933 New Albany directory and 1935 to 1939 Louisville, Kentucky, city directories. Peake’s Louisville address was 2301 Speed Avenue. The same address was in the 1940 census. Peake was living with a medical doctor and his wife. Peake provided the art for Freak Patents which was written by Carlile Crutcher. The series debuted April 22, 1935 in the Courier-Journal. A photograph of Peake in the Courier Journal, November 12, 1938, described him as an artist, musician and critic. One will get you five that Thomas Harvey Peake knows beards very well. A former free-lance writer and artist, Peake is 87 years old and lives at Bedford, Va. He’s old enough to have worn a billowing beard himself. He spent his childhood at New Albany, where he was born, and later lived in Kentucky for a while. One also will get you five that he's one of our oldest contributors. Peake passed away October 3, 1958, in Bedford, Virginia, as recorded on the death certificate viewed at Ancestry.com. Peake was laid to rest at Fairview Cemetery. Ben Hammond was the editorial cartoonist for the Wichita Eagle in the 1910s and 20s, and was always an able if not outstanding penman. Unfortunately, by 1941 when Hammond came up with the strip Hoots and Quacks, his best years were frankly behind him. When I first saw Hoots and Quacks I assumed that I was looking at the work of an amateur teen, not a seasoned veteran on the cusp of his 60s. It says something very good about the powers that be at the Wichita Eagle that they ran this daily strip for at least a year (I have examples as early as July 1941 and as late as July 1942), obviously out of respect and friendship for this cartoonist who gave the newspaper his best years. Very decent of them. Hammond seems to have tried to syndicate Hoots and Quacks, but I imagine he did so with no success.